Years of toil and experimentation have resulted in the first evidence ever of the long-theorized ‘ghost particles,’ or neutrinos. Scientists with the MicroBooNE physics experiment in Illinois used a 40-foot long particle collider for the job. Neutrinos are subatomic, nearly weightless particles that carry no electric charge and don’t interact with light – and thus, cannot be seen. They only interact by way of gravity or nuclear decay. This makes spotting them next to impossible. After light particles, which are called photons, neutrinos are the most numerous particles in the entire universe, and thought to be the foundation of matter. In early October, the Nobel Prize for Physics was awarded to a Canadian and a Japanese researcher, who worked independently to prove that neutrino oscillations exist, thus proving that neutrinos have mass after all. This is significant because their supposed lack of mass was what was thought to make them so hard to find. On October 15, after a 13-week shutdown, the Fermilab accelerator complex near Chicago shot a beam of protons, which are used to make neutrinos, which was analyzed by the MicroBooNE particle detector. On looking at the data, scientists finally gleaned the first ever detectable evidence of neutrino particles. “It’s nine years since we proposed, designed, built, assembled and commissioned this experiment… That kind of investment makes seeing first neutrinos incredible,” Bonnie Fleming, professor at Yale University and co-spokesperson for the experiment said. 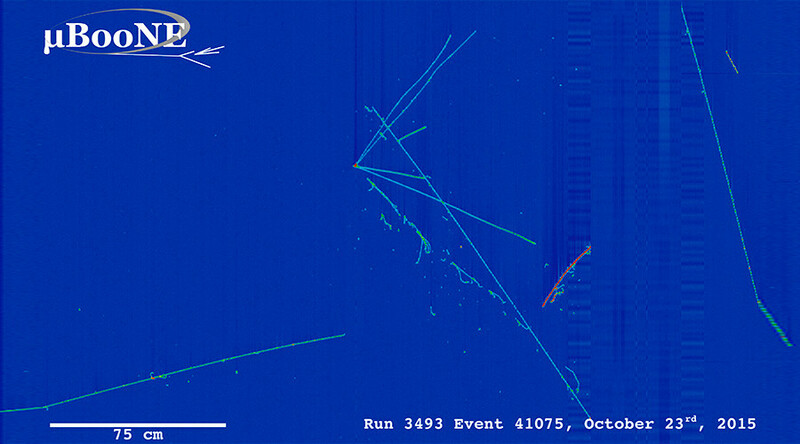 On November 2, MicroBooNE released the images of the first neutrino event candidates identified by the automated neutrino event reconstruction. “More than 100 people have been working very hard to make this happen. It’s exciting to see the first neutrinos,” postdoc Anne Schukraft said. The MicroBooNE experiment was designed specifically to observe neutrino interactions and shifts occurring within a 500-meter distance. The detector is also designed to give scientists 3D projections with as much precision as possible. The findings will lay the foundation for further studies using longer distances. “We’re learning a lot from this detector. It’s important not just for us, but for the entire neutrino community,” Sam Zeller, another co-spokesperson, said.